Not to be confused with Fermanagh. County Fermanagh (/fərˈmænə/ fər-MAN-ə; from Irish: Fir Manach or Fear Manach, meaning "men of Manach") is one of the thirty-two counties of Ireland and one of the six counties of Northern Ireland. The county covers an area of 1,691 km² (653 sq mi) and has a population of 61,805 as of 2011. Enniskillen is the county town and largest in both size and population. "the Country of the Lakes"
Contae Fhear Manach is the Irish name; Countie Fermanagh, Coontie Fermanagh and Coontie Fermanay are Ulster Scots spellings (the latter used only by Dungannon & South Tyrone Borough Council). The Cuilcagh range, on the Cavan/Fermanagh border. Fermanagh is by far the smallest of Northern's Ireland's six counties in terms of population, with just over one-third of the population of Northern Ireland's next smallest county, Armagh. It is the second smallest county in Northern Ireland by area and is ranked 25th in Ireland by size. Fermanagh borders County Tyrone to the north-east, County Monaghan to the south-east, County Cavan to the south-west, County Leitrim to the west and County Donegal to the north-west. The county town, Enniskillen, is the largest settlement in Fermanagh, situated in the middle of the county. It is mainly rural, with a population density of 36.1 people per km2, and is situated largely in the basin of the River Erne. It is dominated by two connected lakes: Upper and Lower Lough Erne, and, including water, spans an area of 1,851 km² (715 sq; mi). It is approximately 120 km (75 mi) from Belfast and 160 km (99 mi) from Dublin. Under Köppen climate classification, Fermanagh experiences a maritime temperate oceanic climate with cold winters, mild humid summers, and a lack of temperature extremes. Fermanagh accounts for 13.2% of the land mass of Northern Ireland and 30% of Fermanagh is covered with lakes and waterways. With 24,000 hectares of forest cover, or approximately 14% of total land area, Fermanagh is well above both the UK and Irish national averages. Due to its expansive lakelands and scenic rural countryside, much of the county is set to be designated an Area of Outstanding Natural Beauty. The county is situated over a sequence of prominent faults, primarily the Killadeas – Seskinore Fault, the Tempo – Sixmilecross Fault, the Belcoo Fault and the Clogher Valley Fault which cross-cuts Lough Erne. To the north of Lough Erne, the oldest rocks in the county are found. These are red beds that were formed approximately 550 million years ago. In eastern Fermanagh there are extensive sandstones that were laid down during the Devonian, 400 million years ago. Much of the rest of the county's bedrock geology dates from the Carboniferous, 354 to 298 million years ago. These rocks are primarily marine muds, shales and limestones, which have produced extensive cave systems such as the Shannon Cave, the Marble Arch Caves and the Caves of the Tullybrack and Belmore hills. These carboniferous shales aggregate across several counties in the northwest of Ireland - known colloquially as the Lough Allen basin - and are estimated to contain 9.4 trillion cubic metres of natural gas, equivalent to 1.5 billion barrels of oil (approximately $115 billion at 2018 prices). 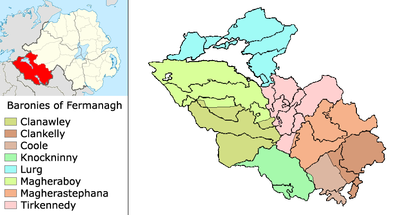 The county has three prominent upland areas, the expansive West Fermanagh Scarplands to the southwest of Lough Erne, which rise to some 350m, the Sliabh Beagh hills to the east on the Monaghan border, and the Breifne mountain range along Fermanagh's southern border, which contain Cuilcagh, the county's highest point, at 665m. The Menapii are the only known Celtic tribe specifically named on Ptolemy’s 150 AD map of Ireland, where they located their first colony- Menapia – on the Leinster coast circa 216 BC. They later settled around Lough Erne, becoming known as the Fir Manach, and giving their name to Fermanagh and Monaghan. Mongán mac Fiachnai, a 7th-century King of Ulster, is the protagonist of several legends linking him with Manannán mac Lir. They spread across Ireland, evolving into historic Irish (also Scottish and Manx) clans. The Annals of Ulster which cover medieval Ireland between AD 431 to AD 1540 were written at Belle Isle on Lough Erne near Lisbellaw. Fermanagh was a stronghold of the Maguire clan and Donn Carrach Maguire (died 1302) was the first of the chiefs of the Maguire dynasty. However, on the confiscation of lands relating to Hugh Maguire, Fermanagh was divided in similar manner to the other five escheated counties among Scottish and English undertakers and native Irish. The baronies of Knockninny and Magheraboy were allotted to Scottish undertakers, those of Clankelly, Magherastephana and Lurg to English undertakers and those of Clanawley, Coole, and Tyrkennedy, to servitors and natives. The chief families to benefit under the new settlement were the families of Cole, Blennerhasset, Butler, Hume, and Dunbar. The closure of all the lines of Great Northern Railway (Ireland) within County Fermanagh in 1957 left the county as the first non-island county in the UK without a railway service. With the creation of Northern Ireland's district councils, Fermanagh District Council the only one of the 26 that contained all of the county from which it derived its name. After the re-organisation of local government in 2015, Fermanagh was still the only county wholly within one council area, namely Fermanagh and Omagh District Council, albeit that it constituted only a part of that entity. For the purposes of elections to the UK Parliament, the territory of Fermanagh is part of the Fermanagh and South Tyrone Parliamentary Constituency. This constituency is renowned for high levels of voting and for electing Provisional IRA hunger-striker Bobby Sands as a member of parliament in the Fermanagh and South Tyrone by-election, April 1981, shortly before his death. Agriculture and tourism are two of the most important industries in Fermanagh. The main types of farming in the area are beef, dairy, sheep, pigs and some poultry. Most of the agricultural land is used as grassland for grazing and silage or hay rather than for other crops. The waterways are extensively used by cabin cruisers, other small pleasure craft and anglers. The main town of Fermanagh is Enniskillen (Inis Ceithleann, 'Ceithleann's island'). The island town hosts a range of attractions including the Castle Coole Estate and Enniskillen Castle, which is home to the museum of The Royal Inniskilling Fusiliers and the 5th Royal Inniskilling Dragoon Guards. Fermanagh GAA has never won a Senior Provincial or an All-Ireland title in any Gaelic games. Only Ballinamallard United F.C. take part in the Northern Ireland football league system. All other Fermanagh clubs play in the Fermanagh & Western FA league systems. Fermanagh Mallards F.C. played in the Women's Premier League until 2013. The railway lines in County Fermanagh connected Enniskillen railway station with Derry from 1854, Dundalk from 1861, Bundoran from 1868 and Sligo from 1882. The railway companies that served the county, prior to the establishment by merger of Londonderry and Enniskillen Railway, Enniskillen and Bundoran Railway the Dundalk and Enniskillen Railway which was later named the Irish North Western Railway, thus forming the Great Northern Railway (Ireland). By 1883 the Great Northern Railway (Ireland) absorbed all the lines except the Sligo, Leitrim and Northern Counties Railway, which remained independent throughout its existence. In October 1957 the Government of Northern Ireland closed the GNR line, which made it impossible for the SL&NCR continue and forced it also to close. The nearest railway station to Enniskillen is Sligo station which is served by trains to Dublin Connolly and is operated by Iarnród Éireann. The Dublin-Sligo railway line has a two hourly service run by Irish Rail Official site – Timetables, bookings and operations The connecting bus from Sligo via Manorhamilton to Enniskillen is route 66 operated by Bus Éireann. Wikimedia Commons has media related to County Fermanagh. ^ "Background Information on Northern Ireland Society – Population and Vital Statistics". Cain.ulst.ac.uk. Retrieved 20 October 2012. ^ "North-South Ministerial Council: 2004 Annual Report in Ulster Scots" (PDF). Northsouthministerialcouncil.org. Archived from the original (PDF) on 2 September 2012. Retrieved 20 October 2012. ^ "Tourism Ireland: Yierly Report 2007". Tourismireland.com. Archived from the original on 17 July 2012. Retrieved 20 October 2012. ^ "Dungannon & South Tyrone Borough Council". Dungannon.gov.uk. Archived from the original on 8 April 2013. Retrieved 20 October 2012. 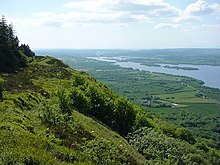 ^ "County Fermanagh - definition of County Fermanagh by The Free Dictionary". Thefreedictionary.com. Retrieved 17 August 2016. ^ The Irish Times, 2011 - "What's your fracking problem?" ^ "Central Statistics Office: 2011 Census". Cso.ie. Retrieved 20 October 2012. ^ "Histpop – The Online Historical Population Reports Website". Histpop.org. Archived from the original on 7 May 2016. Retrieved 20 October 2012. ^ "NISRA – Northern Ireland Statistics and Research Agency". Nisranew.nisra.gov.uk. Archived from the original on 17 February 2012. Retrieved 20 October 2012. ^ "Fermanagh Genealogy Resources & Parish Registers | Ulster". Forebears.co.uk. Retrieved 17 August 2016. ^ Hajducki, S. Maxwell (1974). A Railway Atlas of Ireland. Newton Abbott: David & Charles. maps 6, 7, 12. ISBN 0-7153-5167-2. ^ Sprinks, N.W. (1970). Sligo, Leitrim and Northern Counties Railway. Billericay: Irish Railway Record Society (London Area). Wikivoyage has a travel guide for County Fermanagh.